Rare, Rare, Rare! Here is a custom Sailor's boarding and Skinning Knife with a scrimshawed whole Sperm Whale tooth handle - just like the 19th century ones you've seen in museums. This is not a replica -The tooth is Department of Commerce registered. The tooth pictured as an example, and the knife were etched and made by America's favorite scrimshander M.M. Cohen - Both the blade and the tooth are signed. You get to choose the etching on the tooth. 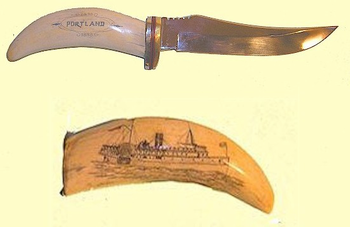 (The tooth shown is scrimshawed on the front side with an exquisitely detailed etching of the famous steamer Portland. (The Portland was built in 1890 and served as a ferry between Boston and Portland until 1898, when she went down in the infamous November blizzard of 1898, with the loss of over 400 lives. The back of the tooth is etched with the name "Portland" and the dates 1890 and 1898.) (Click on pictures for larger image.) Let us etch your choice of nautical scene! Knife blade length is 5 5/8 inches. (Even has thumb grooves!) Overall length is approximately 10 inches. Double guard - brass and stainless - with red-black-red liner between. Choose a right handed whales tooth to make this knife fit perfectly in your right hand -or a left-handed tooth for your left. High carbon stainless steel cryogenically tempered. A perfect one-of-a-kind addition to any collector's treasures. Available only for shipment to addresses in Maryland.